The introduction of the first electrical recording by the Victor Talking Machine Company using the Westrex process in 1925 was one of the most important milestones in the history of the gramophone. 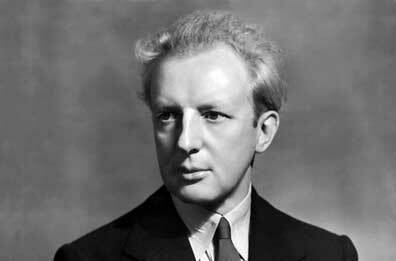 Leopold Stokowski and the Philadelphia Orchestra were in the vanguard of that new era, recording in March 1925 the first electrical recording of a symphony orchestra in the world! In 1926, Stokowski and the Philadelphia Orchestra made a further major advance by initiating what were the first recordings of a fidelity sufficient that music lovers could, for the first time, hear a full symphony with reproduction allowing enjoyment of the masterworks. This was the end of recordings in which the music "...sounded like being played by a group of banjos..." - often the description of the orchestra recorded by the acoustic process. Key to this major advancement was the agreement by the Victor Talking Machine Company in the Spring of 1926 to install the Westrex electrical recording system in the basement of the Philadelphia Orchestra's home in the Academy of Music, Philadelphia. This change had three important components. The first improvement was not only the installation of electrical recording equipment, but of a Westrex system which seems aurally superior to the recording system Victor had used in Camden in 1925 for the first electrical recordings. This may have been a combination of improved condenser microphones, and of improved recording heads. For example, the Western Electric Model 394 condenser Microphone Transmitter may have been introduced at about this time, including in the Philadelphia recordings. The Academy of Music, the orchestra's home concert hall provided an added openness and atmosphere to the recordings. This ambience or "air" in the recording was intentionally missing from the relatively dead acoustics of the Camden Church Studio where the Philadelphia Orchestra had been recording. In the acoustic era, recording engineers had judged it important to have an acoustically dead studio for successful acoustic recordings. 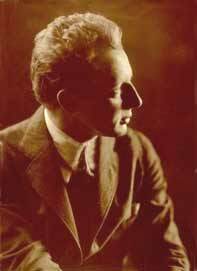 Third, Leopold Stokowski and the Victor recording engineers continued to experiment with the most effective way to capture the orchestra using the new electric recording process. They stopped replacing percussion with contra-bassoons and stopped replacing string basses with bass saxophones and tubas. The new electric recording process was not disrupted by the impact of percussive instruments as the acoustic process had been. Also, since the Westrex system recorded sounds down to about 120 hertz, for the first time, the recording process could capture the double bass strings and other low notes, so reinforcement with bass winds or low brass was no longer necessary. Recall that for the initial electrical recordings of 1925, such as Danse macabre, Victor still used a contra-bassoon to replace the timpani part, and the bass strings were replaced by a tuba along with bass winds, just as they had done with the acoustic process. They had also used a small orchestra, sometimes as few as 40 musicians just as in acoustic recordings. Now, these 1926 recordins employed the full sound of the full Philadelphia Orchestra for the first time. 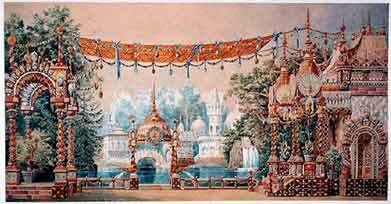 These June 10 recordings were of two waltzes by Johann Strauss II: "On the Beautiful Blue Danube" (An der schönen blauen Donau), and "Tales from the Vienna Woods" (Geschichten aus dem Wiener Wald). Although the waltzes are substantially cut so that each waltz will fit on a very full side of a 12 inch Victor Red Seal disk, the Stokowski arrangements are fully satisfying. Click on the links below to hear these famous waltzes, issued on a double faced 12 inch (30 cm) Victor Red Seal recording, catalogue number 6584, and matrix number CVE 22825-6 (and later take number 7 CVE 22825-7) for the Blue Danube on side A, and CVE 35182-3 for the Tales from the Vienna Woods on Side B. In Europe in 1926, the recording was issued on a 12 inch (30 cm) Gramophone disc catalogue D-1218. Prior to the first 1926 recordings of the Philadelphia Orchestra in the Academy of Music, Stokowski and the Philadelphia Orchestra had made recordings of the first movement of the Franck Symphony in D minor. These electrical recordings were on four 12 inch (30 cm) 78 RPM sides and assigned matrix numbers CVE 34730-2, CVE 34731-1, CVE 34732-1, and CVE 34733-1, all first takes. 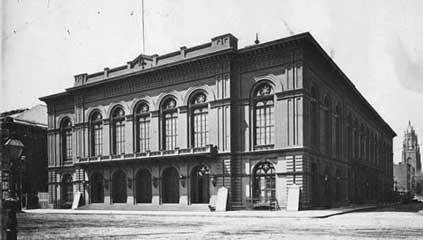 However, it would seem that the greatly superior sound of the orchestra recorded in its home in the Academy of Music caused Stokowski and Victor to end further recordings in the Camden Church Studio location. Also, the orchestra for these recordings, numbering 65 was larger than in the 1925 recordings, but considerably smaller that the subsequent recordings in the Academy of Music, where a full Philadelphia Orchestra, typically of about 100 musicians were recorded. In any case, this recording of the first movement of the Franck symphony was never issued. However, Stokowski and the Philadelphia Orchestra in the next year in October 1927 in the Academy of Music made a famous and highly successful recording of the Franck symphony issued by Victor in album M-22. Following these successful first Academy of Music recordings, on 4 and 10 November 1926 Stokowski and the Orchestra successfully recorded one of Stokowski's favorite Tchaikovsky works: the Suite from the Nutcracker ballet (opus 71a). Stokowski and the Philadelphians had made an initial attempt the week before on 4 November 1926. In fact, Stokowski and the Philadelphia Orchestra had made a number of previous attempts during the acoustic period to record several movements from Tchaikovsky's Nutcracker, beginning with his very first Philadelphia Orchestra recording sessions in October, 1917. At that time, he made recordings of the Dance of the Sugar Plumb Fairy and of the Trepak Russian Dance, which were apparently unsuccessful, and not released. Similarly, in 1921 Stokowski attempted, unsuccessfully, the Waltz of the Flowers. Then in February and April 1921, Stokowski attempted to record the Dance of the Flutes, unsuccessfully, prior to the successfully released disc of this movement in recorded 13 February 1922. An example of the difficulties of recording, even with the far more sensitive electrical recording process was the celesta. In this 1926 recording, the celesta was played by Gustave A. Loeben, who played by cello and keyboard in the orchestra for 35 years, 1919-1954. The recording of the celesta required the difficult compromise between making the celesta audible, versus picking up the internal mechanism of this light instrument. We can imagine how recording the celesta would have been well beyond any ability of the acoustic process to capture. The orchestra during these recordings consisted of: 18 first violins, 17 second violins, 13 violas, 12 celli, 10 double basses, 3 flutes, 4 oboes, 4 bassoons, 5 clarinets, 6 horns, 3 trumpets, 3 trombones, 1 tuba, 1 celeste, 2 harps, 1 tympani, and 2 percussionists. 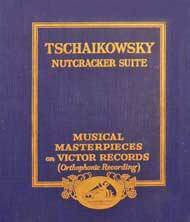 This 1926 recording of the Nutcracker was originally released as three separate disks, Victor 6615, 6615 and 6617. Then, in 1928 when Victor began to issue the famous series of Victor Albums titled the "Musical Masterpiece Series", the Nutcracker became the third Musical Masterpiece album: Victor M-3, which remained in the Victor catalog until early 1935, when Stokowski and the Philadelphia Orchestra's recording made in November 1935 was released as Musical Masterpiece album M-265. In fact most listeners find this 1926 recording more satisfying than the technically superior 1935 recording. The sound and performances of this 1926 recording of the Nutcracker remain thrilling today, and demonstrate just how extensive were the advances of the Victor engineers and of Stokowski in the year since the first 1925 electrical recordings. No doubt, recording in the Academy of Music was also a favorable factor in both the sound and the musicality of these performances. In Victor M-3, matrix numbers for these recordings were: CVE 36655-4, CVE 36656-4, CVE 36657-2, CVE 36669-1, CVE 36670-4, and CVE 36671-2. In Europe, these recordings were issued on Gramophone D-1214, D-1215 and D-1216. - Trepak - Russian Dance (Danse russe). - Waltz of the Flowers (Valse des fleurs). Later in 1926, on 18 November 1926, Stokowski and the Philadelphia Orchestra made another electrical recording hat, like the Strauss Waltzes, was destined to be a long and best selling recording in the Victor Red Seal library. This was the Liszt Hungarian Rhapsody no 2, originally for piano and apparently orchestrated in this recording by Stokowski, rather than the usual Karl Müller-Berghaus orchestration which he had used for the 1920 acoustic recording. Stokowski's transcription performance sets of this Liszt work, with his cuts and orchestration reside in the Leopold Stokowski Collection at the University of Pennsylvania Library. The Liszt Hungarian Rhapsody was recorded on November 18, 1926, with a subsequent make-up session for Side B on March 10, 1927. The orchestra comprised: 18 first violins, 18 second violins, 14 violas, 12 cellos, 10 double basses, 4 flutes, 4 oboes, 4 bassoons, 5 clarinets, 3 trumpets, 3 trombones, 6 horns, 1 tuba, 2 harps, 1 tympani, and 2 percussion. This recording was issued on a 12 inch (30 cm) Victor Red Seal disc catalogue number 6652, matrices CVE 37002-2 (later CVE 37002-3) and CVE 37003-7. 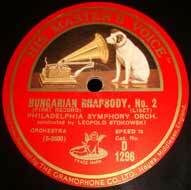 In Europe, it was issued on Gramophone D-1296. The restored recording in the .mp3 links, below, were done by the mastering and restoration engineer Marcos Abreu, and is an excellent and also subtle restoration. You can contact him at Marcos Abreu - Audio mastering and restoration services, email address: mastering@terra.com.br Thanks Marcos ! Recall that in 1919, the second year of Stokowski's recordings, he made a remarkably successful recording of Wagner's Overture to Rienzi, cut to fit on two 12 inch Red Seal sides. 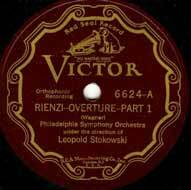 On 18 November 1926, the same day as the first work on the Liszt Hungarian Rhapsody no 2, Stokowski and the Philadelphians began the recording of the full Rienzi Overture on three sides. Sides 2 and 3 were completed on 6 January 1927. These recording dates do present a problem in that the recording acoustics, perhaps the musician placement or perhaps the microphone placement is different for the 1926 and 1927 recording sessions. Also, there are pitch differences among the three sides which must be compensated. However, the result is a grand performance, and the sound, if equalized, is excellent. I believe you will find this recording to be an electrifying performance, with good sound. Listen to Sol Caston's beautiful, exposed trumpet solo of the A natural note which begins this Overture. What a virtuoso orchestra ! Although the 1919 performance was excellent in both sound (for the acoustic period) and performance, the recording progress demonstrated by the 1926 recording is striking. 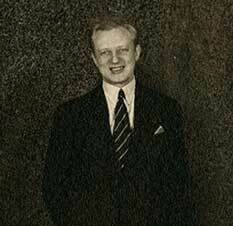 As a dramatic example of the progress in musical reproduction represented by the introduction of electrical recording by Victor, listen to the passage beginning about 2 minutes into the Rienzi Overture in the 1919 recording, followed immediately by the same brief passage from the 1926 recording. Of course, you would expect a marked improvement, but you may find the contrast even more dramatic than expected. Click the link below and have a listen. Wagner's Rienzi Overture was recorded by the Philadelphia Orchestra and Stokowski on 18 November 1926 and 6 January 1927, during the same sessions when the Liszt Hungarian Rhapsody no 2, and the closing scene from Wagner's Götterdämmerung were recorded. The orchestra complement was: 18 first violins, 18 second violins, 14 violas, 12 celli, 10 double basses, 4 flutes, 4 oboes, 4 bassoons, 5 clarinets, 3 trumpets, 3 trombones, 6 horns, tuba, 2 harps, 1 tympani, and 2 percussion. 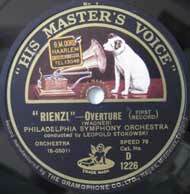 The Rienzi Overture was issued on three 12 inch (30 cm) sides of Victor 6624 and 6625 A, coupled with the closing scene from Die Götterdämmerung, recorded also during the 6 January 1927 session. The three sides were from matrices CVE 37004-1 (from the 18 November 1926 session), and CVE 37700-1 and CVE 37701-2 from the 6 January 1927 session. These recordings were issued in April, 1927. In Europe, the recording was issued on Gramophone D-1226 and D-1227 with the same Götterdämmerung coupling.